Not all dogs vying to become service dogs make the cut. Some come close, and they are so well trained that a number of nonprofits that train them have waiting lists of people who hope to adopt them. Zachary Steinbeiser, an 8-year-old who was born with a neural tube defect that affects the development of his brain, was hoping to get a service dog. He has seizures, autism, and epilepsy. His pediatrician nominated him as a Make-A-Wish participant. He knew Zachary wished for a dog who could be his best friend. 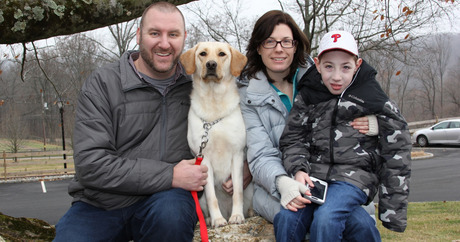 Zachary and his family travelled from their home in Lansdale, Pennsylvania, to The Seeing Eye campus in Morristown, New Jersey, to meet their new family member. Dogs at Seeing-Eye are bred and trained to be guide dogs for blind humans. However, Gibbon explains, not all of the dogs graduate from the program. “Some, like Whitley, are better suited to other jobs, so they are called ‘career change’ dogs,” he says. Some of the reasons dogs don’t always graduate from their training ranges from medical reasons, such as dysplasia of the hip and elbow; high activity level; incompatibility with cats and/or other dogs; and assertiveness. Guide Dogs for the Blind also have “career change” dogs. For more information about “career change” dogs, visit The Seeing Eye or Guide Dogs for the Blind.